When I woke up this morning and realized the temperature had drastically dropped from high 90s to mid 60s, my first thought was : Shoot. I wish I would’ve rocked my romper more this summer. 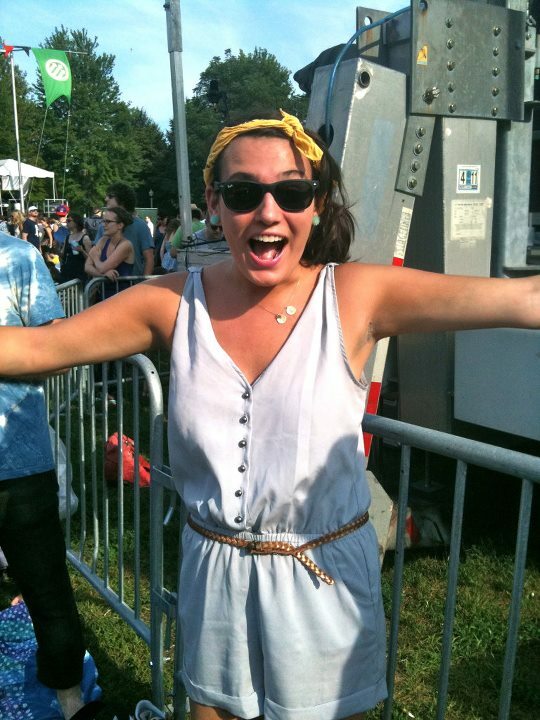 A romper, in all its glory, is seemingly the epitome of summer for some folk, myself included. If it fits correctly, hugging your body in all the right ways, paired with some baller shades, fabulous sandals and some live music, it just screams “summer” to me, in the same way a passion fruit iced tea lemonade from Starbucks does. Tart, sweet & holler for a dollar summer. In the past few months, there were a number of moments, galavanting around in rompers included, that were defining enough for me to sit back and realize, holy crap, this summer was awesome. From ice cream dates, to Lollapalooza after shows, to road trips & new apartments, this summer has been truly epic. I tried a vegan restaurant for the first time (fail), I got rid of the side bangs I’ve rocked for 20+years, I posed sans-head tilt … I mean my god. And yet, I can’t stop smiling as I think back on the great, lazy days of summer. It’s as if all the fun I had last spring, fall and winter were just practice runs for the ridiculously fun, out of control weekends of summer. Summer was our show, definitely. And as I reflect back, I channel one of my favorites. Johnny Castle, be mine. Dirty Dancing is one of the all time greats. That final dance, all it represents – so epic. It just reminds me so much of this summer. Of the happiness, the friendships, the dancing, basically the overall greatness. Most people can agree with me on this one. I grew up on this movie, watching with my family in our living room, as I would dance around in my pink, twirly dress, shouting, “BECAAAAAAAAUSE, I’ve had the time of my life!” (If the dress actually still fit me, I would totally rock out). Nailing down that final dance is on my bucket list, by the way. And most people know, I can’t really dance. Just need to find myself a little Johnny Castle, minor detail. Nobody puts bytes in the corner. But seriously – this has been a summer of fun, food, festivals, and friends. So, with the official start of the fall / birthday season, I want to share some of my favorite moments from summer with you. So, all, lets raise a glass to the sunshine months. Mondays in the Park. Almost every Monday this summer, Millenium Park, featured free, 2 hour concerts in the park, where people were free to bring food + booze, take a spot in the grass and enjoy the music. This particular Monday was for the band Iron + Wine and let me tell you – it was perfect. 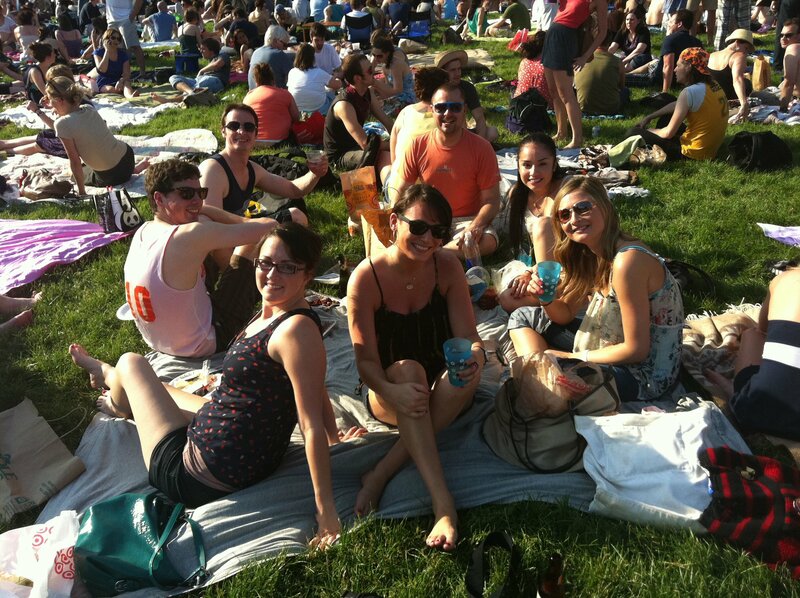 We all brought picnic snacks, plenty to drink, and the weather cooperated just as it should have. Mondays in the Park, I will certainly miss you madly. 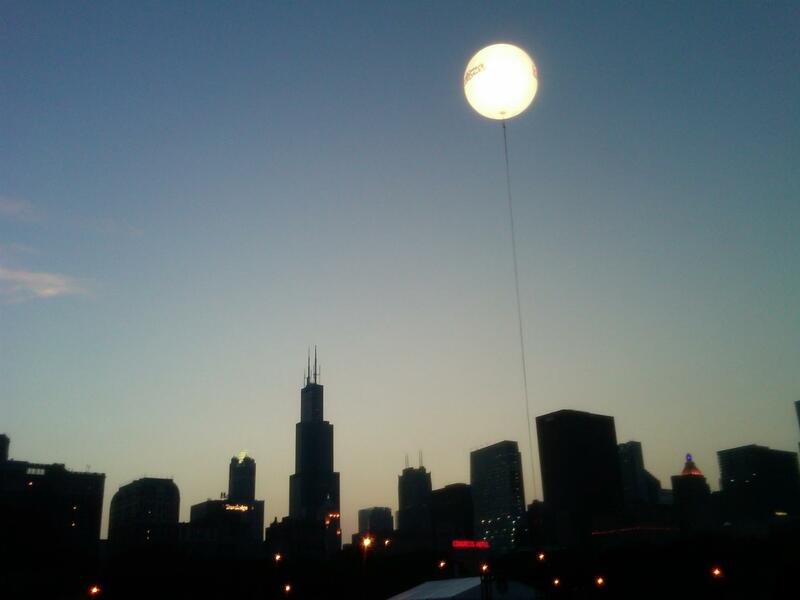 And then there was Lolla. Three days of sweat, crowds, fantastic music, beer, sweat, more music, and more beer. Lollapalooza is a massive, out of control, three day music festival where thousands upon millions of people flock to downtown Chicago Grant Park and take part in listening to their favorite bands, eating their favorite food (Grahamwiches Lobster Corndog, which is only featured at Lollapalooza and not another day after) and basically enjoying being surrounded by sweaty, drunken, fabulous people all day long. One of the highlights, of which there were many, was Muse’s performance the first night, which totally kickstarted the weekend in all the right ways. I know the video doesn’t particularly do the song or atmosphere justice, but truly, it was an experience. Thousands of people, jumping, clapping, singing along to that chorus. The skyline in the background. Those lights. That concert was one of my favorite nights of summer. Something I’ll never forget. Enjoy that 4 minute video. Cherry on top of the cake? Losing tickets, then part magic, part luck, but mostly thanks to my charming friend, gaining 4 tickets to the Foster the People / Lykke Li aftershow at House of Blues. Lets just say, that concert was so “not real life,” I didn’t even hesitate in throwing down mad money for Foster the People’s show in October. Fantastic. So, now the food. I considered summer my time to try new things. For one, I tried vegan. Don’t call me a saint quite yet – I didn’t realize it was a vegan restaurant until after I had sat down. “You didn’t read the menu?,” my mom asked me, as she almost hesitated getting up to leave. “Of course I did,” I replied, “but I looked at the food – I had no clue it was vegan.” Whoops. I don’t know why I ever thought I’d be cool with eating food sans dairy. No cheese? No thanks! I may be lactose intolerant, but screw it – I love cheese. And I love meat. And I really don’t know why I thought ordering tofu lasagna would be yummy. Because it was most certainly not very yummy. A little bland and a little freaky for my tastes. But hey – I tried it and that is a huge feat in itself. Props though, to vegans, I take my fedora off to you. Speaking of fedora, a new sustainable eatery, Prasino, just recently opened up around the corner from our Wicker Park pad. For weeks, we would walk by the restaurant, passing their renovations, in particular on their patio which stretches almost one entire street block on Division. At first glance, I was skeptical. New restaurants more often than not, fail. But let me shout from the rooftops, THIS PLACE IS SO GOOD. This place is so good it got me hooked on gazpacho. And, frankly, I don’t really like soups! 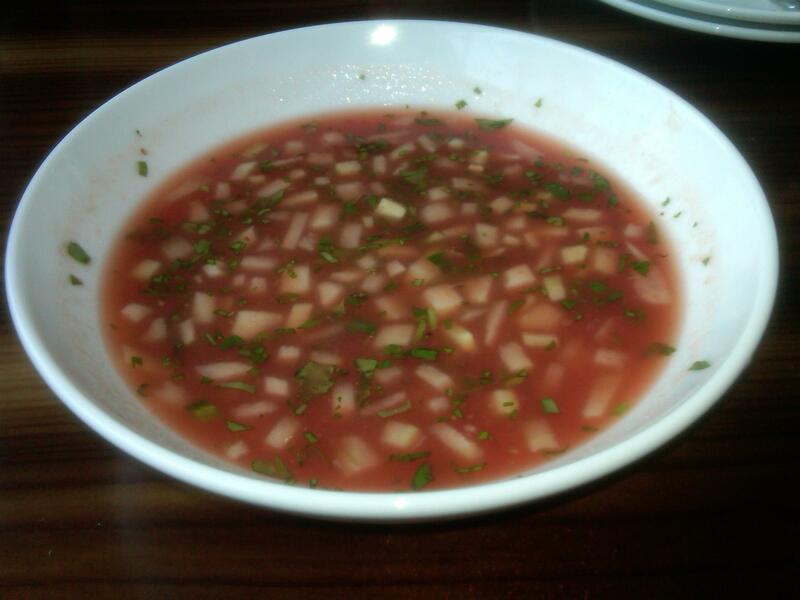 Watermelon cucumber gazpacho that was a touch on the spicy and a touch of the fantastic, ridiculously delicious side. 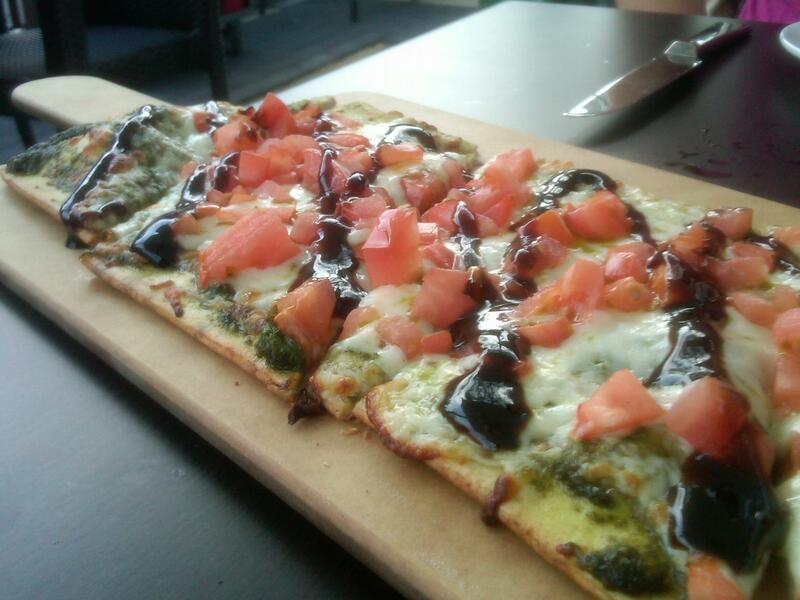 Then came the flatbread. Drizzled with, wait – let me take a second here … – balsamic friggen syrup, only my favorite thing on the face of the planet. So, yeah, I liked it. Could summer be any sweeter? 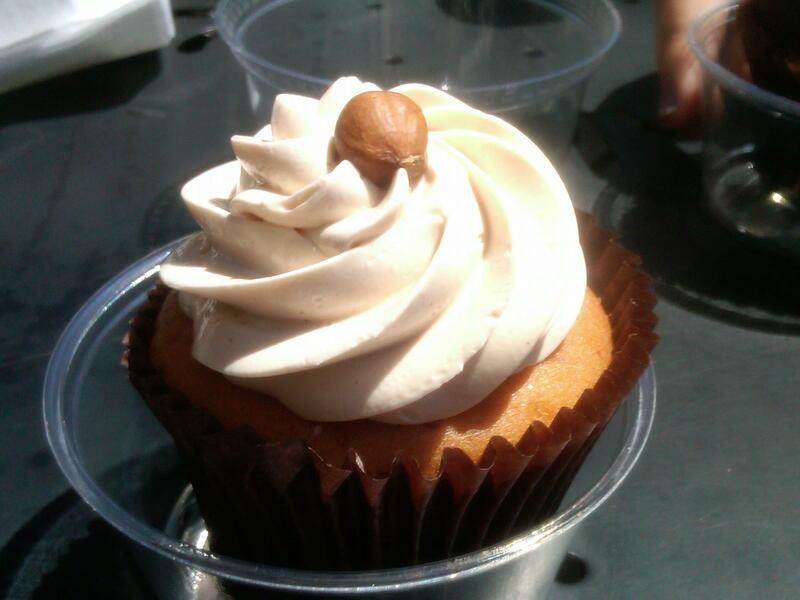 If you live a hop, skip and a jump from Alliance Bakery, it sure is. I never said I was a classy lady. But I will say this – it was a summer of greatness. 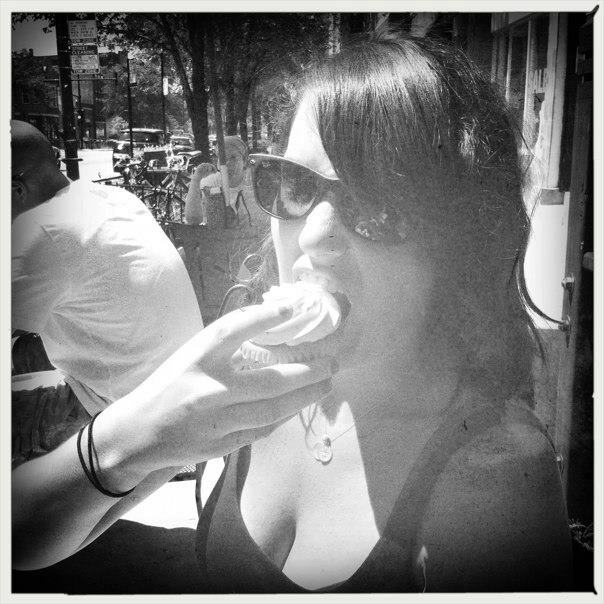 I’ll miss the sunshine, the food, the late night drinks, the patios we hopped, the never-ending laughter and the never-ending lazy hazy daze of happiness that seemed to enrapture everyones summer souls. So I suppose all that’s left to say is this. Bring it on, fall .